This HI4PI map was produced using data from the 100 metre Max-Planck radio telescope in Effelsberg, Germany and the 64 metre CSIRO radio telescope in Parkes, Australia. Image credit: Benjamin Winkel and the HI4PI collaboration. The research looked at neutral atomic hydrogen—the most abundant element in space and the main component of stars and galaxies—across the whole sky in a survey known as HI4PI. The project required more than a million individual observations and about ten billion individual data points. University of Bonn astronomer Dr Juergen Kerp said although neutral hydrogen is fairly easy to detect with modern radio telescopes, mapping the whole sky is a significant achievement. Professor Lister Staveley-Smith, from the International Centre for Radio Astronomy Research, said the study reveals fine details of structures between stars in the Milky Way for the first time. 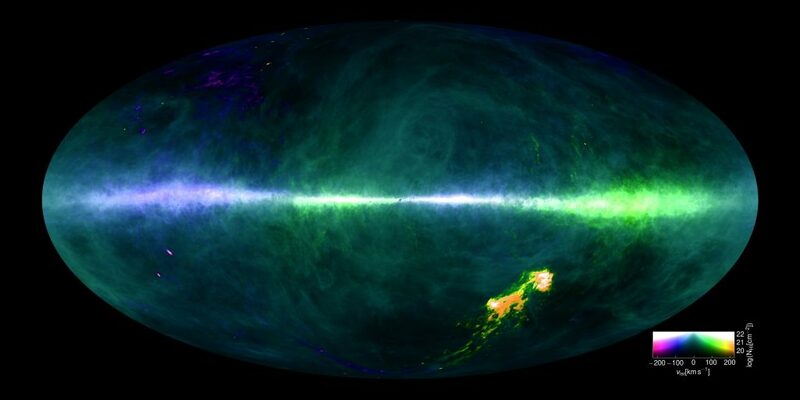 Dr Benjamin Winkel, from the Max Planck Institute for Radio Astronomy, said having a clearer picture of the hydrogen in the Milky Way would also help astronomers to explore galaxies even at cosmological distances. HI4PI data will be freely available to scientists around the world through the Strasbourg astronomical data centre. ‘HI4PI: A full-sky Hi survey based on EBHIS and GASS’, published in the Astronomy and Astrophysics Journal October 20th, 2016. The name ‘HI4PI’ is drawn from the fact that this study measures radio wavelength radiation emitted from neutral atomic hydrogen atoms (HI) across the entire sky. Observing in all directions for an ‘all-sky’ survey in this way creates a sphere of data, and because the solid angle (a two-dimensional analogue of an angle) of a sphere is equal to 4π ’steradians’ (or square radians), we chose the name HI4PI for this work. The Argelander Institut fuer Astronomy (AIfA) is an academic, research and educational institute and a part of the Department of Physics and Astronomy at the University of Bonn, Germany. The institute conducts cutting-edge research over a broad range of theoretical and observational topics from stars to cosmology. The Max-Planck-Institut fuer Radioastronomie main area of research is radio astronomy but the activities of the institute encompass the whole area of astronomical observations throughout the electromagnetic spectrum. Using real data, this animation shows radio emission from neutral hydrogen atoms located in our galaxy, the Milky Way, and our neighbouring dwarf galaxies, the Large and Small Magellanic Clouds. 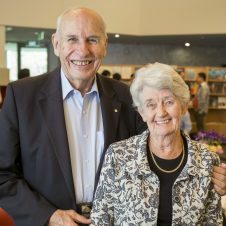 It has been produced using observations made with the 100 metre Max-Planck radio telescope in Effelsberg, Germany and the 64 metre CSIRO radio telescope in Parkes, Australia. The colours reflect the approaching (purple/blue) and receding (orange/green)hydrogen gas motion while the brightness traces its amount. Credit: Lister Staveley-Smith, Benjamin Winkel and the HI4PI collaboration. 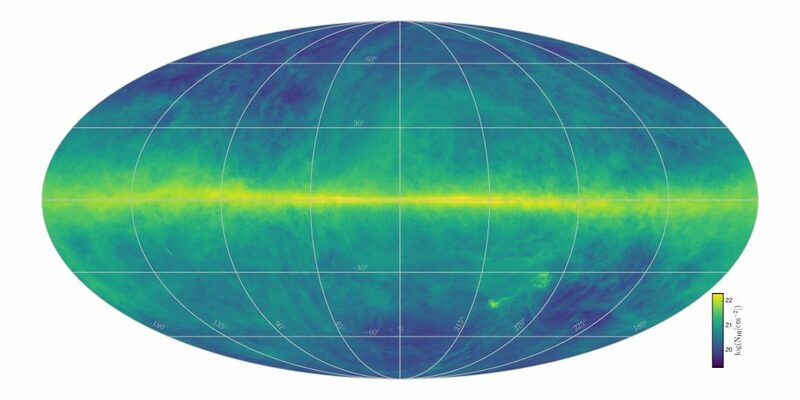 This HI4PI map was produced using data from the 100 metre Max-Planck radio telescope in Effelsberg, Germany and the 64 metre CSIRO radio telescope in Parkes, Australia. 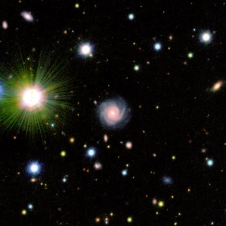 The image colours reflect gas at differing velocities. The plane of the Milky Way runs horizontally across the middle of the image. The Magellanic Clouds can be seen at the lower right. Image credit: Benjamin Winkel and the HI4PI collaboration. This HI4PI map was produced using data from the 100 metre Max-Planck radio telescope in Effelsberg, Germany and the 64 metre CSIRO radio telescope in Parkes, Australia. The image intensity reflects the total hydrogen content. The plane of the Milky Way runs horizontally across the middle of the image. Image credit: Benjamin Winkel and the HI4PI collaboration.